Get ready for #FACT14 at Moses Mabhida Stadium’s People’s Park brought to you in association with Channel O and Ukhozi FM. Established in July 2011, this will be the 14th #FactDurbanRocks to take place at Durban’s iconic venue. Headliner, International Sensation Davido, who just won the best Global and Best African act at the EMAs; Black Coffee has won too many awards to mention and is dominating the globe in house music; #AbutiFillUp who just made History and #FilledupFnbStadium; Dj Tira and his Durban Massacre team took the belt at Red Bull culture clash and Distruction Boyz have the hottest album out now. 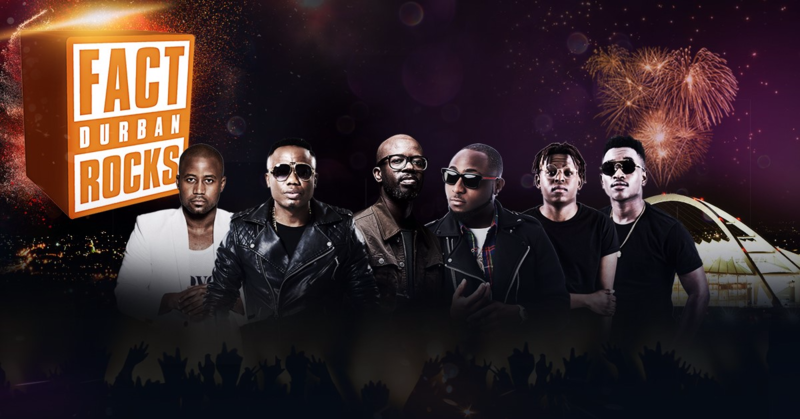 Other artists on main stage are Rocksilver; DJ Answer; Luke & Paras; Tzozo; Hlengiwe Mhlaba; Andile ka Majola; DJ Boonu; Madanon; Gcokama Elihle; Joocy; Duncan; Lvovo; Da LES; Professor; Naak Musiq; Tipcee; Zodwa; PH; Okmalumkoolkat; Babes Wodumo; Duma Ntando; Big Nuz; Benny Maverick; Dladla Mshunqisi; DJ Sox and MCs Somizi; Sthandwa Nzuzu; Smash Africa and Scoop. The always Banging Red Bull Floor will feature International Dj/Producer Hyenah who is often featured on Black Coffee’s albums and mixes. Other artists include NAG; Target & Ndile; Shoti; Amenisto; DJ Mngadi; Costa Dollar; Touch of Soul; Campmasters; KingSfiso; DJ Cndo; Culoe De Song; Merlon; Distruction Boyz; DJ Sbo; Nhlaks; DJ Vuuh; DJ Twitty and Rocksilver.